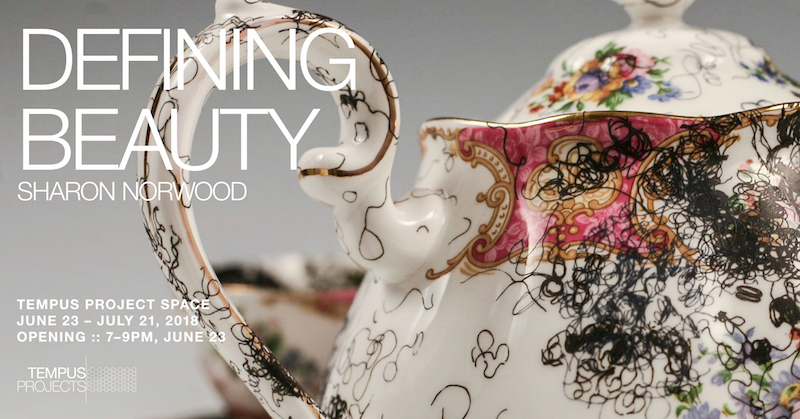 Tempus Projects is proud to present Defining Beauty, a solo exhibition featuring the work of FSU Art MFA ’18 Sharon Norwood. Norwood explores gender, race, and class as well as formal technique and mark making. This exhibition is scheduled to open on Saturday, June 23rd in conjunction with Tempus Projects’ Join Us in June Membership Party, and will run through July 21st, 2018. There will be a short informal discussion with the artist led by Sarah Howard, Curator of Public Art and Social Practice at the Institute for Research in Art/Graphicstudio at the University of South Florida, at 7:15pm on June 23rd. Whether in drawing, painting, ceramic or other mediums, the curved and curly line is at the center of Norwood’s work. This line inhabits a dual presence: as hair, her hair, and gestural mark making. As representations of hair, the lines serve as a medium to create dialogues on issues of race and the black body. At other times, the lines shift from representational to abstract lines as investigations of formal technique, gesture and drawing. Additionally, Norwood often incorporates found decorative tableware, prints and other historical objects that introduce themes of gender, class, and colonialism. Sharon Norwood is an artist of Jamaican heritage and her work spans several media including painting and ceramic. She recently received her MFA in studio art from Florida State University and she also holds a BFA in Painting from the University of South Florida. Norwood’s work has been exhibited nationally and internationally including Florida, Georgia, Baltimore, Kansas City, New York, Canada, South Korea, Jamaica and Germany. She is the recipient of numerous honors including the Jim Boone Endowed Scholarship from Florida State University, the 2016 Raymond James Gasparilla Festival of the art’s emerging artist recognition, and the 2016 Creative Loafing Tampa Bay- Best of the Bay Emerging Artist honor.